Price is per jade Year of the Dragon pendant (as picture - measures about 23mm x 9mm x 7mm + the loop. This is not a necklace, but you could make it into one with a cord. The Year of the Water Dragon begins on 23rd January 2012. The dragon is a lucky sign, the fifth of the 12 animals in the Chinese Zodiac. The Chinese dragon is a much more loving creature than the Western dragon ¨C blessed with supernatural power, fortune, and understanding. Eastern philosophy regards the dragon positively, the supreme beast, fearless, wise and master over all - the dragon represented the emperor. People born under this sign gain power and respect, which is why it is the most popular Chinese zodiac sign attracting an increased birth rate in oriental countries. Dragon years usually bring large happenings, either good or bad - an abundance of yang energy. However, they are positive for finance, and the water dragon acts more considerately then his fellow dragons. This means the usual dragon disasters will be less likely. 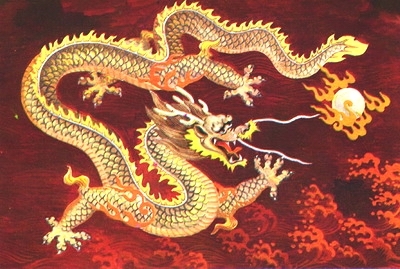 The dragon¡¯s obstinate ego will bring power and bold ambition to 2012, making it a good time to start a business or get married. Dragons like to spend money. Best months in this dragon year are: January, February, July, August and November ¨C and the worst are will be September and December. Generally, people who take chances and are ambitious will benefit in a Dragon Year. People born in the Year of the Dragon are extrovert, brave, quick-tempered, generous, honest and passionate. They prefer being on their own and doing things independently. Their excellent entrepreneurial skills make them successful businesspeople, as well as good inventors, lawyers and salespersons. Dragon¡¯s energy, competitiveness and determination usually allow them to achieve near the top of their profession. Dragons have a deep sincere heart and will give in to love despite their independence, but a thick-skin is needed in their partner to take their quick temper. The best relationships are with either a monkey or a rat ¨C the least compatible being the ox or goat.